You can add new recipes to the database, and update the list of ingredients. 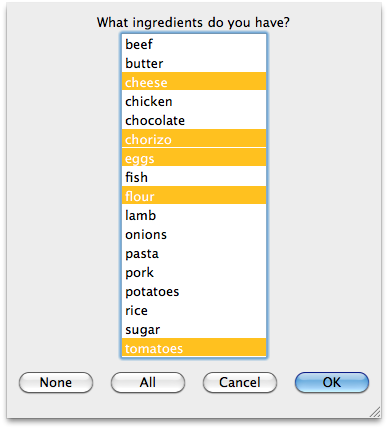 (defparameter ingredient-database '("eggs" "flour" "butter" "chicken" "beef" "pork"
"lamb" "sugar" "chocolate" "onions" "fish" "tomatoes" "pasta" "chorizo" "rice"
The name of the recipe. A list of the ingredients. If the list is empty then the answer is no. If the ingredient is the first item on the list then the answer is yes. Otherwise it's the answer to the question - is the ingredient in the rest of the ingredients excluding the first element? If lista is empty then the answer is yes. Otherwise it's the answer to the question - is the rest of lista excluding the first element a subset of listb? If the list of recipes is empty then answer none. If the first recipe's ingredients are a subset of the list of available ingredients, return that recipe plus the result of checking the remaining recipes. Otherwise return just the result of checking the remaining recipes.